In the guided tour of the exhibition Sigma. Mapping learning 1969-1983, opened to the pubic in one of the office buildings of City Business Center, the curator Alina ?erban said this, while talking about a work by Constantin Flondor: “Knowledge is subjective. You need a me, a you and a witness.” We are the witnesses. In February 2015, we were invited by Nathalie Hoyos and Rainald Schumacher to an exhibition that was, at that time, called Timi?oara Art Encounters. Before meeting the two curators, we did an online search to find out more about the project. The first result was a website on Timi?oara’s cultural agenda, a list of all the financed projects for 2015. The sum of 292.500 RON, out of a total of 8.630.621 meant to be divided between 21 projects, was allocated for the Art Encounters Project (Timi?oara European Capital of Culture had the most money, 700.000 RON). We later found out that the funds had been administrated by the Timi?oara House of Culture without a public contest. We also visited the two curators’ websites and learned that their practice involved mediating between artists and art collectors. We refused to take part in this project in a heartbeat, and for various reasons. During recent years, the ways in which art and culture had been subjected to capital in Timi?oara had accelerated due to the pressure of the city’s eligibility for European Capital of Culture 2021. Moreover, in 2014, Mayor Nicolae Robu even invited the extremist group The New Right to be one of the many political groups that support the European Cultural Capital project. Despite the civil society’s protests, the mayor did not apologize for his act of legitimizing an extremist right-wing group. When we met the two curators, we learned that the businessman Ovidiu ?andor is behind the project. The public money that has been taken from the city’s culture funds was about to be used for an obviously corporate project (with the purpose of supporting the city’s candidacy for European Cultural Capital 2021). On the other hand, the project’s very doubtful concept (an art show featuring Romanian artists or artists that at least refer to Romania in their works) was another sign that pointed out to the idea of revaluing certain artists on the art market. Subsequently, Art Encounters grew and turned into something that not only confirmed, but exceeded our predictions for this project. Art Encounters became a biennial that claims to take place in all the cultural spaces of the city, that extended to Arad and whose curators took a step back (placing themselves at the same level as the two cities’ mayors and the main sponsor, Reiffeisen Bank), leaving the art collector Ovidiu ?andor in the spotlight as the owner of the project. Under these circumstances, our refusal to take part was free of the familiar sense of anguish and tension between the desire to make autonomous critical art and the fear of non-visibility. But the questions remain regarding why our colleagues, artists who make critical art, accepted the invitation. After reading the curatorial texts, the press release and bits of interviews by the curators, it is obvious that the nature of the project was clear from the very beginning. These texts with their collections of common places simply own up to the fact that the project is about the art market and about capitalizing on new territories for said market. The vague concept of the event, “Appearance and essence”, requires very little, yet it claims everything, just like the biennial claimes and appropriates many of the existing initiatives throughout the city, all of the resources and all the energy. So why are artists who make critical art involved? Is this about the critical art’s intrinsic problem of requiring capital and the spaces capital creates to manifest itself? Is this about the artist’s precarity? Is it about desolidarisation? About the capitalist rift between what you believe and what you do? Is it about panic? The fear of letting go: the intention to give visibility to critical ideas on the chimera of Europe in an absolutely invisible workshop of 12 people, where more than half showed up because they knew the artist. The desire to produce critical art without questioning the means of production: the inmates who made up the workforce for cleaning up and arranging Cazarma U are also art material while they sing an ode to materialism in the service of the capital. It’s not just the artists that are less visible in the art market who are afraid they’re missing out. Dan Perjovschi was an adamant supporter for Art Encounters, despite the destructive power that this project entails for the art scene, a power that Dan Perjovschi cannot ignore. The proportions of the project, that declared itself to be “the most important in the last two decades”, has altered Timi?oara’s official stance on how contemporary art is made, about what kind of projects should the city support and what kind of practices are legitimate. A project with the sole purpose of celebrating the link between capital and art, that mixes things so that the art collector is more visible and more involved than the curators, that includes practices and events it does not sustain in any way, is legitimized by important artists that are preoccupied with the state of the art scene, like Dan Perjovschi. 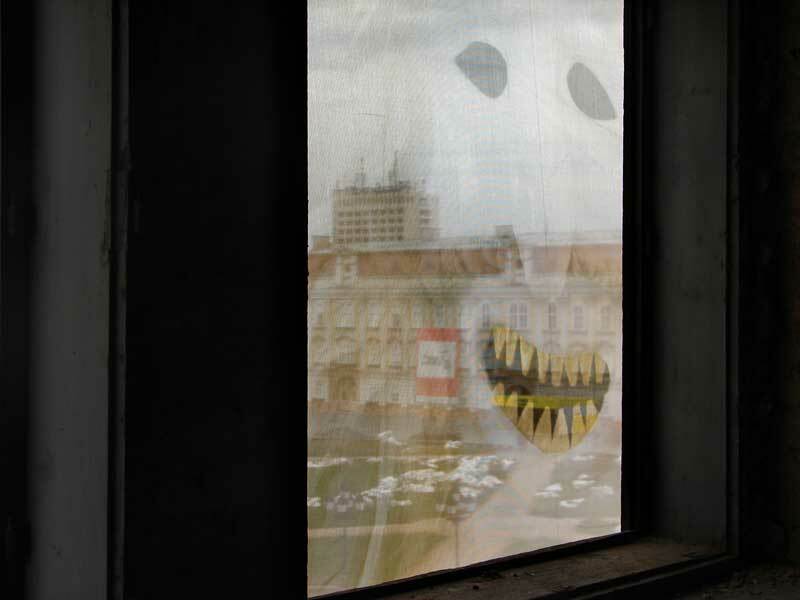 During his presentation at TamTam, a rented space in an old bankrupted factory during the transition period, while talking to the audience members that were seated on improvised chairs or on the steps on the factory, surrounded by graffiti walls, Dan Perjovschi said that he is a mainstream artist that has not forgotten where he came from. A day earlier, we all went to the event’s grand opening, where Ovidiu ?andor had extended his regards to the lecturers from MoMA, Tate Modern and Centre Pompidou, all museums that collect Dan Perjovschi works, being grateful that the lecturers “had the courage to accept our invitation from one of Europe’s ends”. We also went to see the presentations by the representatives of the three museums. They also talked about margins, they showed us maps where Eastern Europe, South America, The Middle East and South-East Asia were marked with various points, we found out about the importance of visiting places where “history has not been yet entirely written”. The colonialist history of the art market. In his presentation, Dan Perjovschi showed us images of long queues and empty stores during the 80s. In their texts and interviews, the curators still talk about “gaps”, “rediscovering” and “reevaluating” “Eastern Europe”. Production budgets that artists received at the very last minute, artists that had to bring their own video projectors from home, events that took place at different hours than the ones in the program, events that were not put in the program in time. 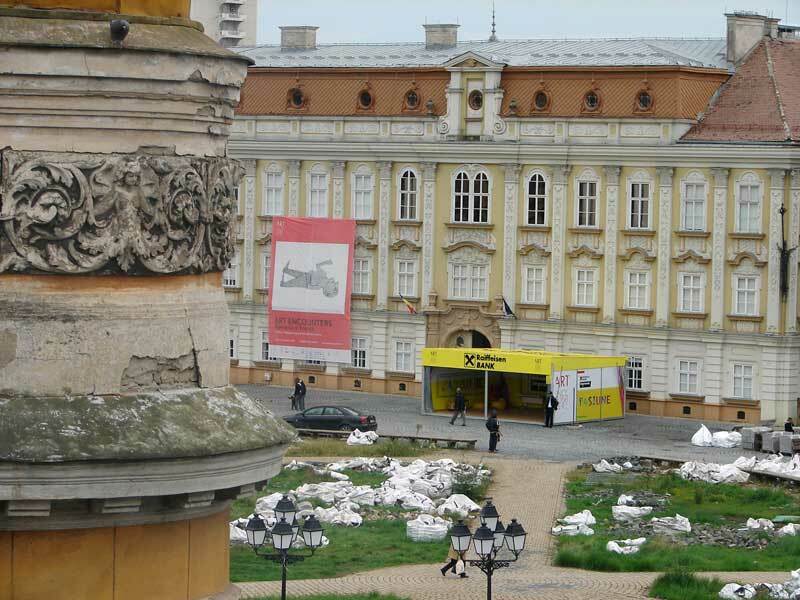 The Synagogue’s gate, which is usually covered by the Simultan banner each year, displays now the Art Encounters banner. The art high school’s old building is waiting to be demolished so that its ultra-central site be “used to its full potential”, according to Mayor Nicolae Robu. After years of protest, the high school was still evacuated and moved to a more problematic location, as is the general tendency to undermine vocational education. This was the building where the Sigma group members worked as teachers and put together some of their projects in the 70s and it was supposed to be the location for the Sigma exhibition. But the necessary forms were not approved, so the exhibition on experimental art and emancipatory education (which was part of Timi?oara’s Architecture Annual, another event that was happening anyway, but was incorporated in Art Encounters) took place at City Business Center, the chain of corporate buildings developed by Ovidiu ?andor. During the mid-90s, when his career took off as a neo-Orthodox painter – the official art of those times – Constantin Flondor called his activity within the Sigma group as “the sins of his youth”. The emancipatory education articulated within Sigma turned into the master-apprentice relationship in the course of 10 years. Constantin Flondor still calls his former students “apprentices”. In recent years, when capital rediscovered a history of opposition and rebelliousness as an interesting element for the art market, Flondor took back “the sins of his youth” and rediscovered and re-created his own past. Timi?oara’s experimental art past is rewritten from the market’s point of view. The research and curatorial work of Ileana Pintilie concerning experimental art is only a marginal piece of this unilateral rewriting. Old opponents of experimental art, the art school professors that have been preparing generations of students to despise contemporary art, are now enthusiastically taking photos. The tensions, disputes, oppositions that make up the recent art history have been wiped clean and bought down to a general celebration of capital, hosted by an aseptic building of glass and steal. Art Encounters took place in Timi?oara and Arad between 3rd-31st of October 2015.